It's a weekend of leftovers at the movies, just like the pounds and pounds of turkey, stuffing and potatoes you no doubt still have laying around. As is traditional, no new films open in wide release on the final weekend of the year, leaving the charts pretty much in stasis. Just out of the configuration of the calendar, most films will see at least a small increase over last weekend's figures – New Year's Eve holds some of the same problems as Christmas Eve for late showings, but not nearly to the same degree. Not as many people are traveling and the issue of getting kids to bed early that night isn't as bad. Even a 9 p.m. showing can get you out in time for the Times Square ball drop. New Year's Day, for that matter, is even better than Christmas Day, as toys are all unwrapped, boring and broken by this point. Just five out of the top 20 films the last time the calendar configured this way earned less over this weekend than Christmas weekend. Two were Christmas themed, one was a horror movie that every single person on the planet has wiped from their collective memories, one was The Life Aquatic With Steve Zissou and the last was (dun dun dun) Meet the Fockers. 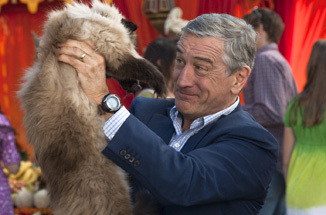 With Little Fockers already running $40 million behind Meet the Fockers' total at this point, that's a troubling piece of history. Note that this isn't a make or break figure, as Little Fockers still stands to make around $150 million or more. Compared to the monstrous film that the second film was, though, this is an indication that Universal can't count on another holiday weekend kicking the film back in gear. With these numbers and the film's tepid reception, we may have seen the last of this dastardly franchise. Watch for it to come in with around $28 million.